Educate providers on HIPAA rules and regulations. An ideal resource for performing ongoing compliance assessments or creating a new compliance program. Includes ready-made templates and checklists covering hot spots of HIPAA with alerts to changes. Designed to help providers implement HIPAA rules and regulations, HIPAA Tool Kit is an ideal resource for creating a new compliance program or conducting a compliance assessment. Includes customizable policies and procedures for HIPAA privacy, security and transactions requirements, and a comprehensive HIPAA encyclopedia covering topics such as the recent Breach Notification rules and risk assessment reporting. 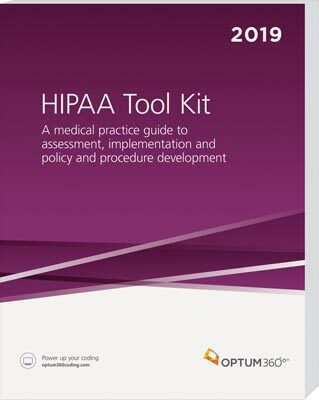 Remember—you get Optum360's 170-page HIPAA Customizable Compliance Plan free when you purchase the HIPAA Tool Kit. Get Optum360's online (downloadable) 100-page HIPAA Customizable Compliance Plan, free, when you purchase the HIPAA Tool Kit. Policies and procedures are ready to be customized and available in easy-to-use Microsoft Word format. Comprehensive management policies and procedures. More than 60 pages of new customizable policies, procedures, and forms. Includes Optum360's detailed Risk Assessment/Risk Analysis tool. Get customizable reports and forms for the risk assessment that the Office for Civil Rights expects you to have in your records. Updated state breach laws. Get state-by-state details of local rules governing breach release of individuals' protected health information. Skills tests. Quantify your own, as well as your staff's, level of understanding of HIPAA topics.